OK, I know that these are not the most glamorous looking of treats, but they taste oh so yummy! My family and I love entertaining and also attend a lot of [church] events/activities which require the bringing of a plate of eats. Now when it comes to whipping up a plate of something sweet, I have a long list of recipes to delve into, but somehow I just don't have that many savoury snacks to choose from (plenty of meals, but not many 'finger foods'). As a result, I have been experimenting a bit to expand my repertoire for when it's my turn to bring a savoury platter. So I needed to make a dish really quickly a while ago - I had forgotten about an activity until just before hand. Because I point blank refuse to buy eats, I peered into my fridge to see what I could put together really quickly. I had plenty of eggs, ham, cheese and cream in the fridge, so a quiche seemed destined to be made! But I didn't have any pastry, nor the desire to make any just then. 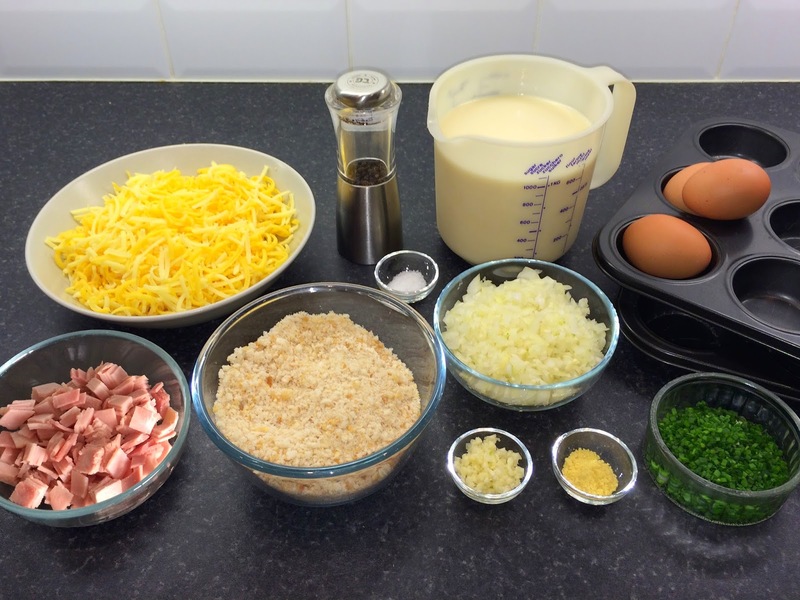 I hunted around on the internet for a few minutes looking for some inspiration, when I found a couple of recipes suggesting the use of panko breadcrumbs instead of a crust. Well, that would work! I had bread, I could make breadcrumbs! I normally make large pie sized quiches, but on this occasion I decided to try making mini quiches instead, because they would be so much easier to serve up! They were a hit, everyone loved them and they were gobbled down really quickly. 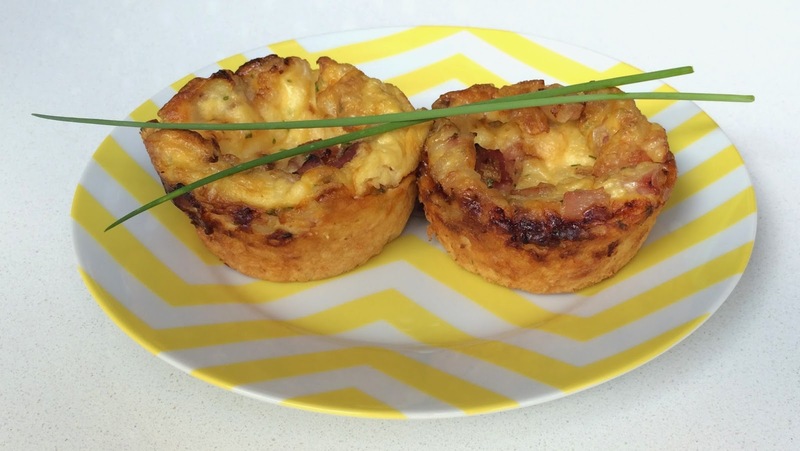 Since then, these little quiches have been a hit every time I share them. Makes 2 dozen mini pies. 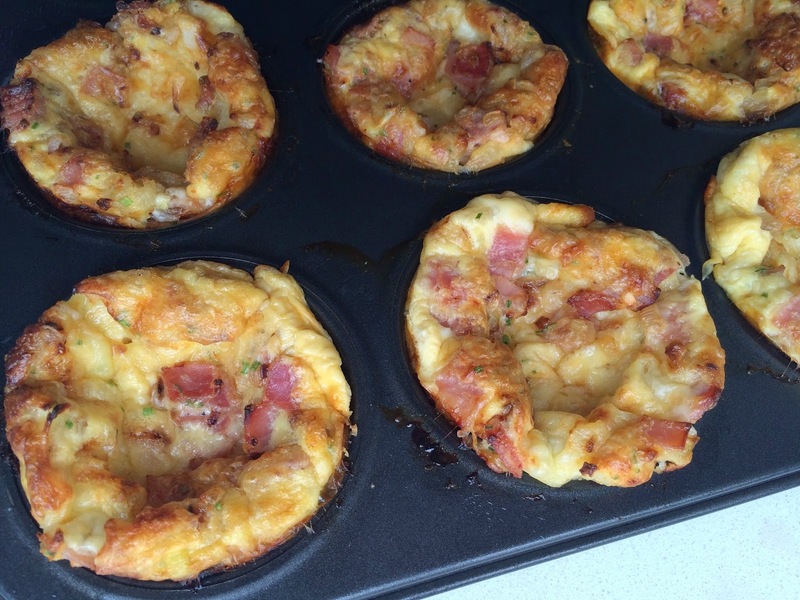 Thoroughly grease the cups of 2 muffin tins. Fry onion and garlic in some oil until caramelised. Remove from heat. Add ham, salt, pepper and mustard powder. Mix well ensuring mustard is well distributed. Reduce a few slices of bread to crumbs in a food processor. Lay crumbs out on baking tray and toast in the hot oven for a few minutes until they start to go golden. Beat together the eggs, milk and double cream. Put 1 TBSP of plain dried bread crumbs in the bottom of each cup. Next, put a mound of cheese in each cup, followed by a spoon of the ham/onion mixture. Sprinkle some chives on top. Pour egg mixture over, should be about 1/4" below top of cup. Make sure everything gets covered by the egg mixture - use a spoon to gently push bits down (some of it will float, that is fine, as long as it has been submerged and has a coating of egg on it). Bake at 200°C for about 20 minutes, until they are nice and golden on top. but they sink down and become hollow almost as soon as you take them out of the oven. Allow to cool in the pans, then very carefully remove and chill. Can also be served hot! I like it whn individuals get together and share opinions. Great site, keeep itt up!